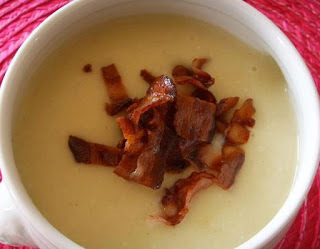 Last weekend I had the pleasure of trying Bacon Cheese soup at a restaurant off the lake in Wisconsin. While the service was awful the soup was DELICIOUS so I set off to see if I could hunt up a recipe to make it at home. I had a bit of trouble finding a recipe (most were bacon potato cheese soups) I was finally able to find one to try! Hoping to make this yummy soup for Sunday's dinner! I'll report on the final results! In a large saucepan, cook bacon until crisp over medium heat, turning frequently. Remove bacon to paper towels to drain, crumble and set aside. Remove all but 2 tablespoons of drippings from saucepan. Add butter to saucepan along with carrots and onion. Cook over medium hear for 3-4 minutes until crisp and tender, stirring frequently. Add flour, mustard, salt, pepper and Worcestershire sauce. Add both kinds of milk and cook until soup has thickened a bit, about 10 minutes. Stir in crumbled bacon and serve.